When thinking about where I have encountered issues with representation, I thought of my experience using the database Early English Books Online (EEBO). It’s not quite as specific of an example as the Beatles and Sgt. Pepper’s, but my experience of this database was probably my first encounter with issues of representing print online, and how different projects privilege different types of representation. You can find the site here, and should be able to sign in through U of T.
In my third year of my undergraduate I was taking a Shakespeare course, and my professor had us do an assignment that asked us to engage with a variety of scholarly resources for a single project. 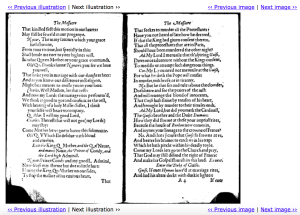 Using EEBO was one of the tasks, while going to see a 1511 edition of Ovid’s Metamorphosis were among the other tasks we were given in our scholarly scavenger hunt (The assignment was focusing on Shakespeare’s education and the texts he would have read). This was the first time I had ever seen a rare book, and the first time I had consulted a database that replicated early printed text. Going to see the rare was obviously one of the most incredible experiences of my life and everything sensory about it stayed with me – the colour and feel of the paper, the binding, the woodcuts, the printed Latin I couldn’t read – but when I searched around various texts on EEBO, I naturally felt fairly underwhelmed comparatively. While the content and layout remained, that characteristic aged colour of the paper was gone, and there was only the pure white of a scanned image (see Figure 1). This makes sense considering EEBO is database of digital facsimiles rather than a digital preservation project with high-resolution photos of actual rares. However the juxtaposition was especially jarring after having been looking at the real thing. I suddenly became aware that while the representation served a purpose, it was missing a great deal of the aspects of reading an early printed book. It also brought an awareness that the medium of a text could inform a reader’s experience in pretty exceptional ways. What was missing from the digital facsimile helped me appreciate the tactile and visual aspects of early print and the importance of conserving it. It also gave way to further thoughts around representation and choice. It’s important to think of digitization as representation because there is a motive behind the act of taking a text and altering it so that it exists in a new state. Digitization both reveals and obscures in the sense that it has an awareness and an opinion about what the end product should say and do, which intentionally guides the reader in subtle (and less subtle) ways that are important to consider when engaging with any text.